Strawberry Lemonade Bars are nice and easy, light and refreshing, summertime treat. Made with only a few convenient ingredients, you can make a batch of these bars in no time flat. Received an invitation to a party? Bring these different bars and watch how fast they disappear. Strawberry Lemonade Bars are made with a package of strawberry cake mix. You can also swap out the strawberry cake mix and use a lemon cake mix. 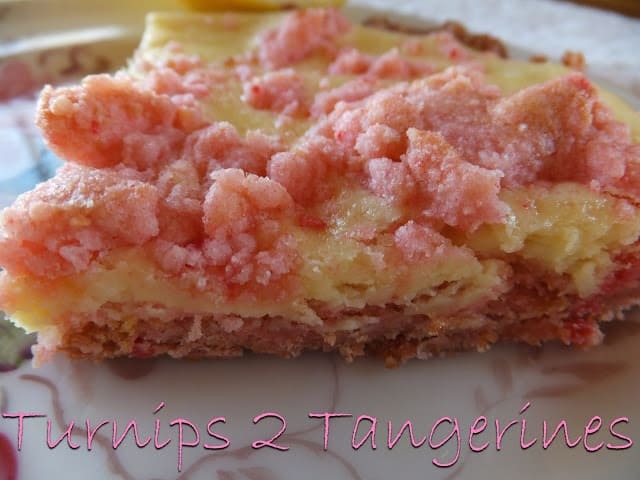 Strawberry Lemonade Bars are super easy to make. Made with a strawberry cake mix, eggs and oil plus an eight ounce package of softened cream cheese. The dry strawberry cake mix is combined with an egg, oil and lemon zest until crumbly. One cup is set aside and the remaining crumb mixture is lightly pressed into a greased 13 x 9-inch baking dish. In the center of these yummy bars is a cream cheese layer. 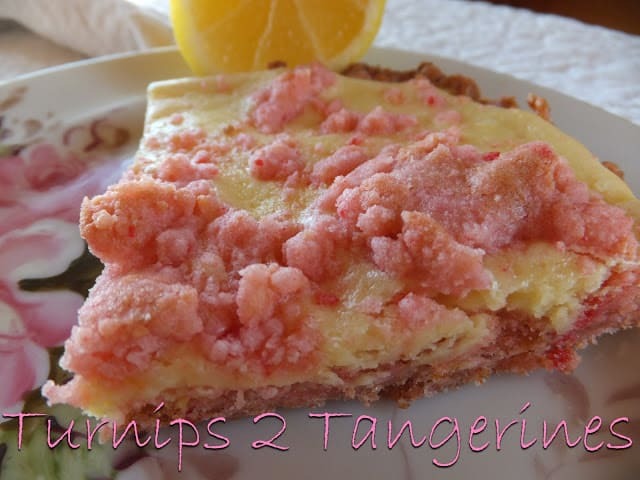 Cream cheese, sugar, one egg and lemon juice are whipped together and then spread over the crust. 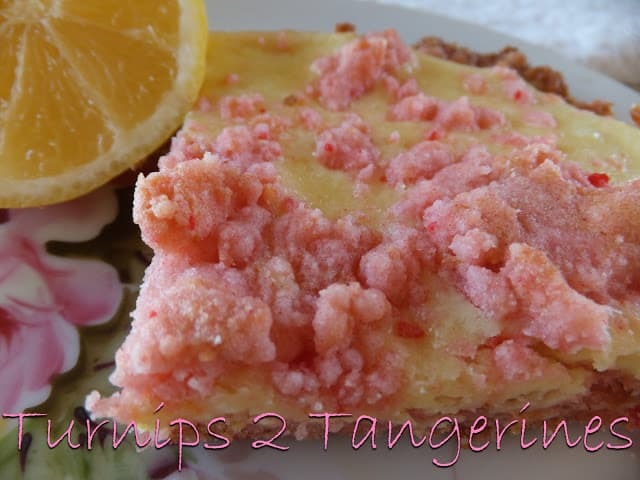 Remaining crumbs are scattered over the cream cheese layer and baked until golden brown. If your looking for a sweet/tart bar, then look no further, here they are! In a bowl, combine cake mix, one egg, oil and 1 teaspoon lemon zest until crumbly. Set aside 1 cup for topping. Press the remaining crumb mixture into a greased 13 x 9 x 2 baking dish. Bake at 350º for 15 minutes or until golden brown. Remove from oven, cool crust 10 minutes. In a small bowl, beat cream cheese until fluffy. Beat in the sugar, lemon juice, remaining egg and 1 teaspoon lemon zest until smooth. Spread over crust. Sprinkle with reserved crumbs. Bake for 20 to 25 minutes or until golden brown. Cool on wire rack. Wanted to pop over and thank you for sharing these at our Weekend Potluck last week. Just wanted to let you know they are being featured this week! Be sure and head over and pick up our "feature" button on the right hand side of the blog. Have a terrific weekend and thanks for linking up! These look wonderfully inviting! Thanks so much for sharing at Weekend Potluck…please come back soon. These bars look delicious and are such a pretty color. Thanks for visiting my blog recently. Have a great week!! I can just imagine biting into one of these delicious bars! So glad to have met you!